TRIVIA of Noh : Q57 : How do you pronounce syllables in the g series? | Home | Trivia | Q57 : How do you pronounce syllables in the g series? How do you pronounce syllables in the g series? 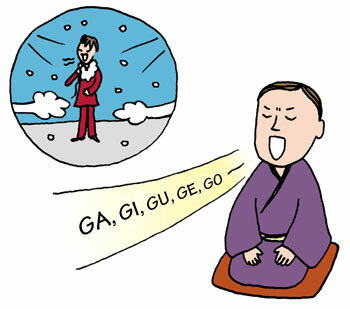 The use of voiced velar nasal consonants was formerly a standard way of the pronunciations of the five Japanese syllables in the g series (ga, gi, gu, ge, and go). Let's call them "the nasal g consonants". You may find close examples of such sounds in those of "g" in "English" and "song". The use of the nasal g consonants is often considered as one of the ways of speaking good beautiful Japanese required for announcers. It may be because they have to avoid pronunciations that offend audience's ears. We can also hear the nasal g consonants are correctly used by several popular Japanese ballad singers. The nasal g consonants have been rarely used in the Kansai and the further western districts, and in some parts in the Hokuriku district. They are getting less used in everyday language these days, maybe because they are difficult to hear. Well, if we return to the Noh world, the important characteristics of the Japanese pronunciation, including the nasal g consonants and the double consonants (or the long consonants), is emphasised as a basic skill of chanting. Especially the nasal g consonants are considered to be important and frequently used even where it is not normally used, such as at the beginning of words or in repetitive phrases. Thus mastering the nasal g consonants could be an essential skill to make progress in the Noh chanting.